Since finishing up the audio problem series, we at Macie Video Service have increased our technical staff, finished our shop expansion with the addition of a second camera set-up station, and are in the middle of a better organization of our parts inventory. We are now gearing up for servicing digital recording camcorders and decks. As many of you probably know, we have not had the time to devote to any format other than Betacam. We are beginning to see increased demand for servicing digital recording camcorders from our own client base, but more of that in an upcoming newsletter. Now I will cover an important issue that has a major effect on long term operation of almost all video gear. In a previous newsletter entitled "Forever Young", I wrote about several issues concerning proper care and maintenance of your cameras, camcorders and decks. One of them was about a problem we have seen more and more in recent years, failure of surface mounted electrolytic capacitors. Capacitors are components used in electronic circuits for coupling of signals, filtering of power, timing of signals, etc. They are constructed with metal foil, separated with an insulator soaked with an electrolyte solution, and encased in an aluminum shell. These components are not subject to wear such as heads and pinch rollers, but instead deteriorate from heat and age. With video gear being around for decades, why has this become such a big problem? The answer lies in its miniaturization. It started in the late 80s with the development of camcorders, where both camera and VTR had to be shrunk into a case the size of just a camera. 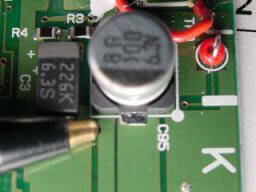 Nearly every component - heads, integrated circuits, resistors and capacitors - all have shrunk in size. These smaller caps have smaller and thinner housings, wire leads, insulation, and seals to keep electrolyte fluids captive. The results are earlier internal failures and greater chance of this corrosive fluid leaking out and damaging the PCBs (printed circuit boards). Life span of caps in prior gear was rated in excess of ten thousand hours, compared to newer ones rated in the low thousands of hours. Problems can be as numerous as you can imagine, considering that almost every circuit uses these caps. The cost of repair varies with trouble-shooting time and extent of physical damage caused if the cap leaks badly. 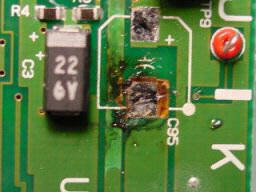 Often it is too late to cost-effectively repair the PCB, so it must be replaced. This capacitor is good. Note shiny finish where cap is soldered to board. This eventually turns dark gray just before leaking. 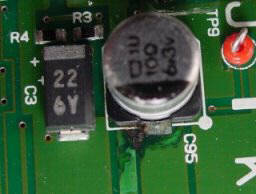 This capacitor has leaked electolyte onto the PCB. Note the blackened area on the PCB. 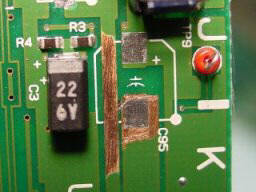 To repair the board, the corrosion must be scraped off and cleaned. What, you ask, are we doing about this problem? First we are trying to let you know what to expect in terms of maintenance problems for you gear. As for our servicing, we are on the lookout for tell-tail signs of failures of these components, by making visual inspections of all caps as gear begins to age, and checking for audio / video record and playback problems. As it turns out it is more labor cost effective to replace a PCB board full of caps than to trouble-shoot just the bad ones, because with proper soldering equipment we can replace each one in just 4 minutes. With just an hours labor we can replace quite a few caps, which gives that PCB a new lease on life. By the way a typical broadcast camcorder uses about 100 of these caps, a popular field deck uses about 300. Our ongoing preventative maintenance of camcorders involves a systematic refurbishment of the PCBs as we discover problems developing, usually when the gear is 6 to 8 years old. We continue this over a period of several service check-ups until all the PCBs are done. This maximizes reliability and spreads out maintenance costs. A total camcorder recap costs about a third less than an upper drum replacement and should last another six to eight years. What can you do about this problem? Retire or sell gear before it hits 6 years old. Repair each problem as it happens, which will nickel and dime you to death and probably hurt your client relationship. Consider preventive maintenance and begin a refurbishing program, which will spread costs and improve reliability. Unfortunately it's not just broadcast camcorders that have this problem but virtually all video gear from broadcast to consumer, from cameras to decks, and from manufacturer to manufacturer. Did I hear anyone say disposable gear? On a personal note, my own 8-year-old consumer camcorder failed to operate recently. I recapped it without any trouble-shooting and it came back to life, hopefully for another 8 years. That's the good part of being handy at fixing gear. How do you know if your video equipment has these trouble-making caps? Remove a cover and look inside for ones similar to the above pictures. Prepare yourself for the inevitable. Create a plan for either maintenance or replacement. By the way, because of our Internet exposure we get many e-mail inquiries about service from around the globe and too often we are asked about not only broadcast equipment but also consumer camcorders as well. Our primary service is with broadcast television field cameras, camcorders and decks. We serve in excess of a thousand broadcast freelancers, government agencies, sport networks, rental companies, production companies, and manufacturers. We have been supporting Ikegami for over ten years with their HL-V55 and HL-V59 camcorders. Our secondary focus has been with maintenance of PVW and UVW studio decks and Sony's eight-inch field monitors, which seem to be the standard field monitor these days. As you all know we also specialize in professional camera set-ups on most cameras and camcorders, from DVCAM, BetacamSP, BetaSX, Digibeta,and even DVCPRO.